Miller Starr Regalia (MSR), a preeminent California real estate law firm for more than 50 years, announced today that Travis A. Brooks is joining the firm’s Walnut Creek office as an associate in the firm’s land use department. 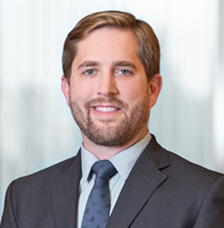 Prior to joining Miller Starr Regalia, Brooks was an associate in the Sacramento office of Harrison, Temblador, Hungerford & Johnson LLP, where his practice focused on representing developers, investment groups, resource extraction and renewable energy companies in all areas of land use and environmental law. He advises clients and develops strategies to help them achieve their development, business and litigation goals and represents clients in civil trials and hearings in state, local, and federal forums. "One of the firm's primary goals is to attract talented attorneys and Travis fits the mold. He joins a marquee practice and will be working with great lawyers and mentors to help guide our clients through the planning and development process" said Ella K. Gower, Miller Starr Regalia's managing shareholder. MSR’s Land Use Practice Group guides clients through California’s complicated development permitting and California Environmental Quality Act (CEQA) compliance process at every level of government, facilitating and expediting project entitlements and related environmental review. In addition, Miller Starr Regalia works with clients in connection with land use due diligence, entitlement strategy, project coordination and negotiation, and all aspects of project implementation. MSR publishes two land use practice blogs: CEQA Developments and Land Use Developments. Brooks received his B.A. from Colorado College and his J.D. (with great distinction) from the University of the Pacific McGeorge School of Law. Miller Starr Regalia has had a well-established reputation as a leading real estate law firm for more than fifty years. For nearly all that time, our firm has written Miller & Starr, California Real Estate 4th, a 12-volume encyclopedia on California real estate law. We call it “the Book.” The Book is the most widely used and judicially recognized real estate treatise in California and is cited by practicing attorneys and courts throughout the state. Our firm has experience in all real property matters, including full-service litigation and dispute resolution services, transactions, acquisitions, dispositions, leasing, common interest development, construction, management, title insurance, environmental law, and redevelopment and land use. For more information, visit www.msrlegal.com.